Eric Fling and I went out on Saturday afternoon to fill the cooler with specs. We took a bucket of minnows and our slip bobbers out and started jumping brushpiles. The very first one we pulled up to was packed with 2 pound BASS! 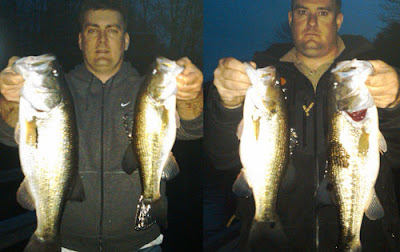 We caught bluegill, ring perch, 2 dozen bass but no CRAPPIE! They just weren't there... Very weird because I caught some there the day before. Anyways... we hopped around to a few other piles until we hit the mother load. We limited out and caught a few nice ones... Here's the best (or worst) part... Towards the end I decided to put a large minnow out just for giggles... small aberdeen hook, 6 lb test, etc. You can probably tell where this is going. Something big, I'm assuming a large bass, took the minnow and headed for deep water ripping drag and eventually breaking off. DARN! I would have liked to see that one. This weekend was some of the best "fishing" that I have done in a long time... I didn't win any tournaments, no seminars, not even a client trip... I didn't catch fish on the latest greatest gear or lure... I didn't even get my boat up on plane! Here's the deal... As a competitive fisherman and guide, one tends to get all wrapped up in pre-fishing, and "points" and the next best wack-a-ma-doolie-dropper that your product sponsor has coming out. Although those things are very necessary to compete and progress, it is even more necessary to just stop and remember what it was that got you so hooked on fishing in the first place... What helped you develop that insatiable passion for the sport? For me it was a trip with my dad and his buddy, Nick, when I was 4 years old... We were in a 12 foot jon-boat with a 10 horsepower tiller and a cooler full of ham sandwiches. I still remember the sandwiches perfectly... They were ham, cheese, lettuce, and mustard on white bread... Just barely soggy from being in the cooler all morning. And I remember Dad's "Lunker Lure" copper-bladed buzz bait with a yellow skirt. I really don't remember much else, except for a few cloudy images of lilly pads and the rusty gas can in the back of the boat... But I do remember that It was the most awesome day (and ham sandwich) that I ever had in my 4 year old life... So much so that I am still talking about it. 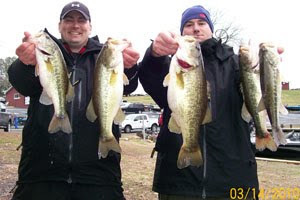 We fished the second LAPR Tournament yesterday... Our pattern changed slightly due to all of the rain over the weekend, but we were able to stick with it and get a 1st place finish, with Taylor boating the tourney big fish as well... We are on about 4 different schools of fish that are keyed on bait and very picky about when and how they will let you catch them. The next 2 to 3 weeks would be a great time to book an evening trip during the week and get an opportunity to catch some nice toads... 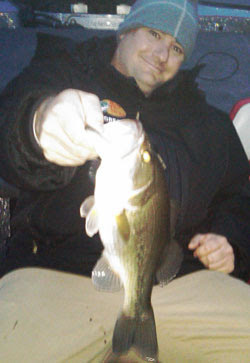 The water was about 52 degrees everywhere we fished and the jerkbait was the most productive tool we used. We got out for about 2 hours this evening and managed to put together a pretty nice limit. Taylor and I are trying to stay prepared for the tourney this Sunday so we're trying to figure out where they will be in two days... 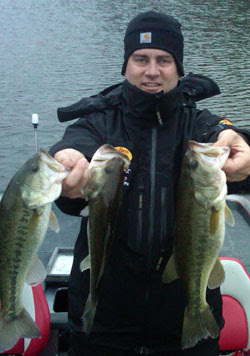 They are pretty oriented to bait and open water in the 52 degree range so they are hard to pinpoint... There is a tom of rain in the forecast for tomorrow so hopefully they don't move too far. The front passing may push them close to cover or shut them down all together, who knows. 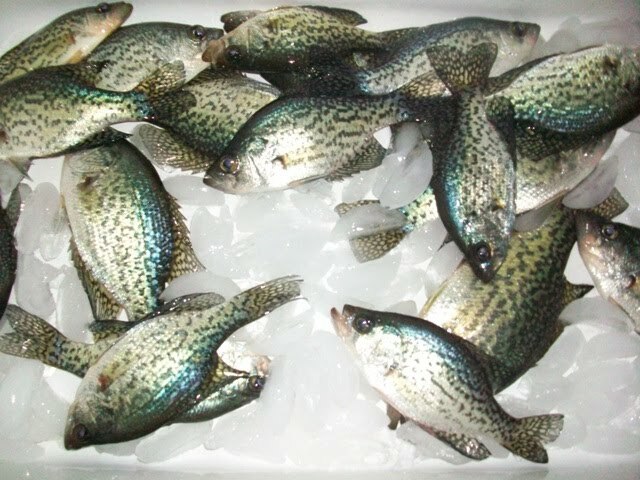 Taylor and I managed to hit one of those perfect situations this evening where the fish were literally crushing our baits... We fished for about three hours this evening and caught some really nice chunks... Largest was probably about 5 lbs... We were down lake with water temps of about 52 degrees... There was bait everywhere... This was the fourth day of a major warming trend and it really showed. The fish woke up in a major way. It looks like we are going to get rain for the next few days so it's likely to all change again... That's March for you!